I adopted Nola in 2004 from Blue Dog Rescue in Austin, TX. I had adopted a dog the previous year from the same rescue. I had actually seen Nola then, with a very sad story saying she was not yet ready for adoption, she had severe heart-worms and a pancreatic disorder that was being diagnosed. Her story involved a life of homelessness and probably abuse. She was found scavenging at McDonalds and was taken to a shelter, where her foster, Debbie Tolany, found her, took her in, and fought tirelessly to diagnose and treat her heath issues. 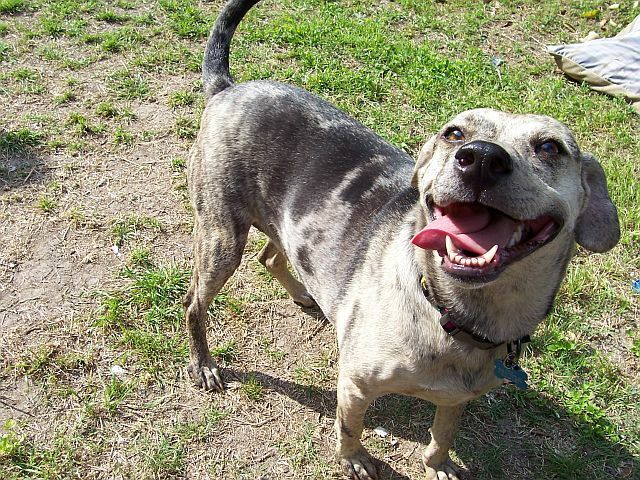 She named her Nola becauseshe was part Catahoula Leopard Dog, the state dog of Louisiana. I wound up adopting another dog, Henry, who was old, very severely abused, and in the year I owned him, even with intense behavioral training, just became more and more aggressive. He eventually bit a friend and I made the decision to put him to sleep. The trainer I used had a dog, a deaf dog, who she had originally fostered, and just kept because she said she never met anyone she trusted enough to adopt him to. She said she saw my commitment to Henry, and if I wanted, she would be happy to give me Mojo, who she thought would be happier in a home with less dogs (she had 4 others then). So I took him. However, as that year wore on, I notice Mojo never seemed content when I was not home. He seemed to be on constant patrol, I thought because he was not able to hear. I also noticed that if I left him at my house with a friend’s dog, he was content and usually asleep when I came home. I thought “This dog needs a dog.” So I went and looked again at Blue Dog Rescue. Well, there was Nola, almost a year and a half later, still there, healthy, heart-worm free and diagnosed with EPI, still not adopted. I brought Mojo to meet her at an adoption event, and tried out a weekend in my house with her. They got along great and I adopted her. Nola came already diagnosed, already a member of the EPI enzyme co-op, and already a lover. She did, in fact, provide the companionship I was looking to give Mojo. And over the 6 years we were together, I got married, we lived in England – dogs included – had a son who is 3 and a daughter who is 18 months. She loved my kids and my family unconditionally, as dogs always do. I was always told that the heart worms probably severely weakened her heart, and although she was diagnosed at Texas A&M, the fact is the veterinary community does not know a ton about EPI, and my vets, here and in the UK, said they just did not know what long term effect that disease can have on a dog’s other organs, etc. But Nola was always happy, and healthy, so I did not worry about the future. About a month ago, she developed a cough, which the vet initially treated as Bordetella. That made no sense to me since she did not go to dog parks, or kennels, and really had no opportunity to catch Kennel Cough. I also had a nagging feeling for the month or so previous that she was dying. She had slowed, a lot, suddenly, and just was not completely herself. But I tried the antibiotics, and it did seem to improve the cough. Then on Sunday, November 7, she started really coughing again. So much so that I was going to take her to the Emergency Vet. Then she settled down and I figured I would take her to her own vet in the morning. We left to go to dinner at my parent’s house, and when we returned, she had passed away. My 3 year old had thankfully fallen asleep on the way home and went right to his bed. She had passed very soon before we came home – she was still warm, so I did not have to see her looking much different that I always saw her, which I think was another blessing. Even in her death, she did me the favor of making it as easy as possible. She was not out of sorts for long; she did not leave me to make that awful “quality of life” decision we pet lovers so often have to make. We will miss Nola terribly. She was such an important part of our lives. She was a great friend to my children. My 3 year old knows Nola went to Heaven, but my 18 month old is still spending part of the day wandering around calling “Nola” with her goldfish crackers out to give her. She is too young to understand where Nola went, and only knows she does not come when called anymore. I know that will stop, and the pain will ease as time goes by. And it has brought us closer to Mojo, who I think we all feel the worst for. We spend every minute we can with him, taking him everywhere we can, and I think that has been good for him and us. I am not the typical EPI owner. I adopted my EPI dog knowing the deal. And if I knew then what I know now, about her sudden death, I would absolutely still have made the same choice. Nola’s presence in my life for 6 years was worth the pain I feel at her passing. We love you Nola and you will be missed.